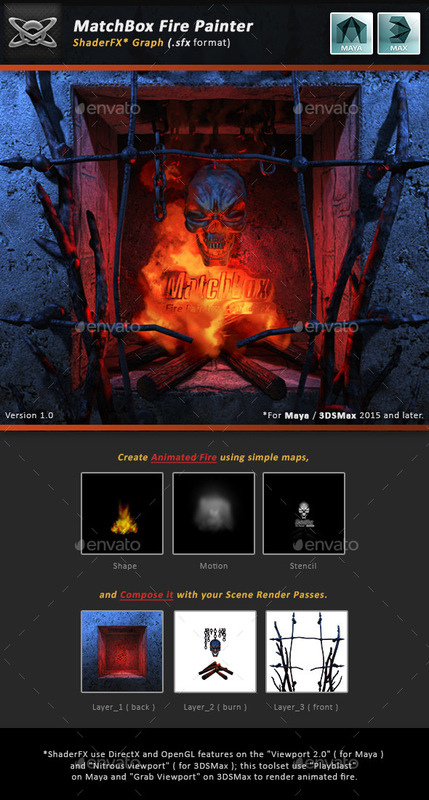 Use MatchBox Fire Painter toolset to generate animated fire textures ( using uv-noise-distortion to simulate fire motion ) and mix it with other images ( like a background ). Render your final composition and use it for mobile-games ( as sprites / flipbook ), as animated textures for 3D projects, or use it for video projects on AfterEffects. All parameters are located on the Attribute Editor ( for Maya ), or in the Material Editor ( for 3DSMax ). Check the Tutorial videos to view several workflow samples.